Maine June 2010, DSA Meeting in Orono and Jackman. Tuesday 6/29: I had about half the day today before I needed to head for home. A little wary of the car, I followed Michael to the last turn for Seven Mile Bog and then crowded in with everyone in his car for the short trip down. We then started to walk. Lots of emeralds (Somatochlora) today were along the road and we found several species. We also had a few Rusty Snaketails (Ophiogomphus rupinsulensis) and a few other things. Eventually, we reached the trail to the bog. 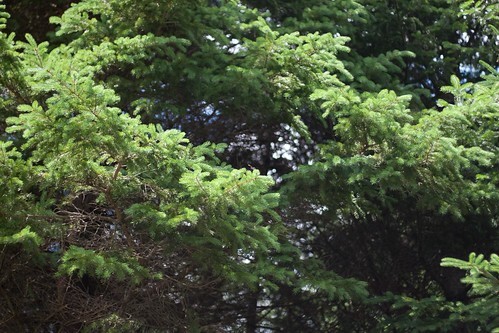 It was rather poorly marked but we whacked our way through the spruces and made it to the edge. It was very rough going, sinking in at almost every step. Fortunately, the main target, Subarctic Bluet (Coenargion interrogatum) was present in good numbers along the edge. I also flushed a thrush off a nest and we heard several snipe winnowing. It was getting a bit late and I was moving more parallel to the edge than out into the bog, so I decided to head out. Dan, who is rather tall, was having enough trouble that he decided to bail as well and work the road instead. We found a cleaner path back and I started walking for the car. It probably took close to an hour to get there (with a couple stops to chase things plus saying goodbye and updating late arrivers). I finally reached the car around 1:00 and started for home. The ride back was pretty easy, except for one of the hardest rainstorms I’ve even seen around Waterville. I pulled over and grabbed a burger and it was dry out by the time I finished. From there, it was a straight ride home, getting in just in time for dinner. Sunday 6/27: Today was the second day of field trips. After checking out of the hotel, I sat around in the main hotel’s parking lot for a while trying to get a ride (Civic isn’t great on dirt roads and my tire may or may not have been low). Eventually, I ended up with Fitch and the Hummels and we headed in the direction of 1000 Acre Heath. On the way, we stopped at a river. Several other groups were here as well. Unfortunately, there were very few bugs out (lots of stonefly exuviae though). We did manage a snaketail or two but that was about it. Moving on, we reached the road to the heath. At the first stream crossing, we pulled over and explored a bit. There were tons of emeralds in the air (baskettails (Epitheca) and Cordulia and Dorocordulia mostly) along with many jewelwings and a spiketail or two down low. Several of the jewelwings were Suberb (Calopteryx amata) and they lived up to the name. 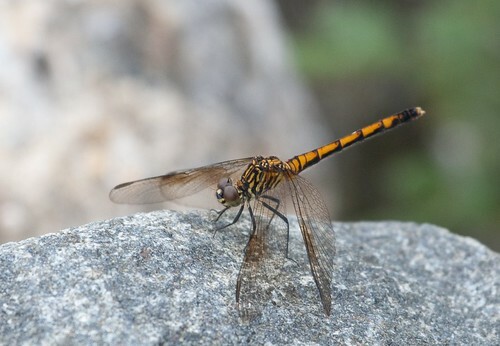 Marcia also came up with a Least Clubtail (Stylogomphus). We continued on and Fitch’s car started making odd noises. It didn’t sound good, but we decided that with most of the group ahead of us, we’d keep going for now. We made a few short stops and had a few odes but nothing of real interest. Eventually, we reached the parking for the heath itself. The walk from here was still a mile or two and there was very little out. The heath was way down a hill and other people were starting to head out, so we never actually reached it. Fortunately, the car held up and we made an immediate stop for ice cream on reaching the main road. Back at my car, I decided to head partway to Jackman (the site of the postmeeting). I only ended up a few miles down the road as it was late and I didn’t want to deal with back roads. I stopped at a Barnes and Noble to finally grab a DeLorme and then decided that the timing was right to head back to the Neurocordulia spot. It was a bit tougher alone, but I did manage to capture one Stygian Shadowdragon (N. yamaskanensis). Then it was back to the hotel and a Wendy’s for dinner. Monday 6/28: Today I headed for Jackman. It was drizzly and rainy most of the way. I eventually reached the hotel and found a good portion of the group (most had come out the day before). No one on the staff was around, so I wasn’t able to try for a room. I wandered down to the market and bought some muffins, then ended up trying the Bishop for a room instead. I did get one, but had to go through the maid’s storeroom to reach it (although talking with people, it still was probably better). Since the weather was lousy, I took a ride just to scout before eventually heading back to the group. Somewhere along the way, I ended up on a rather rocky, narrow road. If it wasn’t so narrow I would have turned around, but I pushed through and apparently lost one of the bolts holding my bumper on. Getting through the rocky area, I found the road I was following under water, so tried another one which was not on the GPS. Fortunately it did lead through eventually and I got back on the main highway. Everyone went out for dinner (and the leaders finally arrived). We went to the one restaurant that was open, forget the name but it was not too bad. Most of the group went out on a moose drive after. I had lingered to discuss tomorrow for a minute or two and never caught up with anyone but drove around for an hour or two myself. The fog was rather scary but I did eventually see a moose (and would learn the next day that about two minutes after I passed the Rosenbergs, they had a huge bull moose). Finally getting around to posting this. Appears I took very few photos. Friday 6/25: Today was one of the field trip days. After heading to the main hotel early and a bit of sitting around, I ended up in a car with Dan and Wally heading for the Machias River. We made a quick stop at the local Hannaford for sandwiches and then started the hour or so drive to the river. At the river, we quickly put on wading footwear and splashed in, joining several others already there. Things were flying and I quickly netted a spiketail. It turned out to be a Twin-spotted (Cordulegaster maculata), which was new for me. The next thing in the net turned out to be the bug of the trip. The river is known for large numbers of snaketails (Ophiogomphus), which are really cool, very green dragonflies. Many are quite hard to find (apparently they spent lots of time perching way up in the treetops and only occasionally come down to the water). Several were flying back and forth and after a few swings (very few compared to others), I caught one. Pulling it out of the net, I could see some color in the wings, which made it Pygmy (O. howei), one of the most sought-after species. At this point, I (stupidly) handed it to Nick Donnelly and let him put it away without bothering to pick up the camera. For a look at one, see Ed Lam’s report from 2007 (which is pretty similar to the meeting as a whole). We spent several hours here and I didn’t have much more success with the snaketails. There were plenty of Brook (O. aspersus) around and others got Extra-striped (O. anomolus), Maine (O. mainensis), and Rusty (O. rupinsulensis). 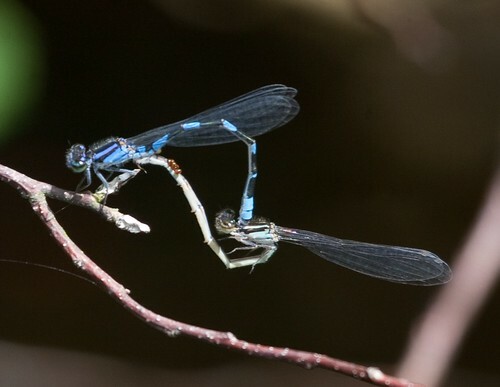 Other things included many River Jewelwings (Calopteryx aequibilis) and Hagen’s Bluets (Enallagma hageni). Eventually, we moved on to another section of the river that others had raved about. It must have been time of day, as we were not impressed. There were a few Brook Snaketails around and not much else. We started the loop back on Stud Mill Rd. 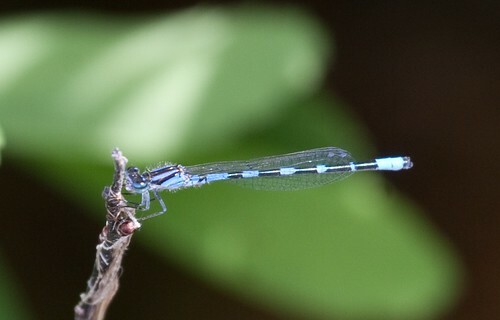 Along the way, we stopped at a pond that was a known site for Little Bluet (Enallagma minisculum). It was rather nasty, full of decomposing leaves (and I was hurting from the old sneakers and all the gravel from the river), but working around the edge we quickly found a large number of bluets, most of which appeared to be Little. We also had a few skimmers and a baskettail here. Further down Stud Mill Rd (wish I remembered where, I wasn’t driving or navigating), we pulled off at a bog. Lots of Sphagnum Sprites (Nehallenia gracilis) and Four-spotted Skimmers (Libellula quadrimaculata) were around along with a few whitefaces (Leucorrhinia sp). 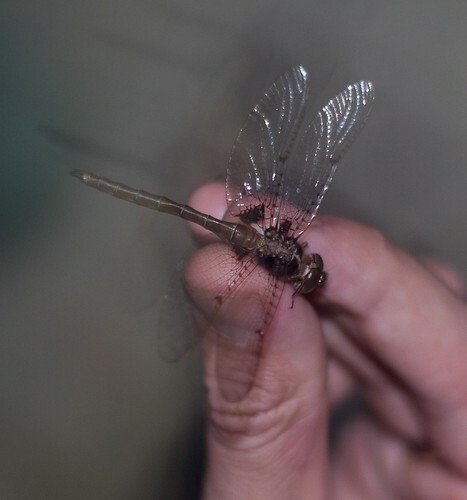 There were apparently some Elfin Skimmers (Nannothemis bella) out in the bog, which we didn’t bother plunging in for (thankfully Bryan brought one out). 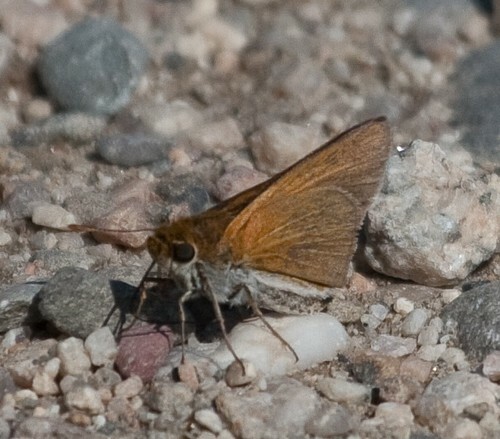 Bog Coppers were visible as well, a new butterfly for me. Along the road, others caught a couple Emeralds that turned out to be Delicate (Somatochlora franklinii). This was one of Dan’s targets for the trip, so we spent some time looking for more. I’m pretty sure I had a couple flying but they eluded capture. We eventually continued on, trying to find another boggy spot. Unfortunately, it was not as accessible from the road as it appeared on the map (others did bushwhack straight downhill) so we never really found it. 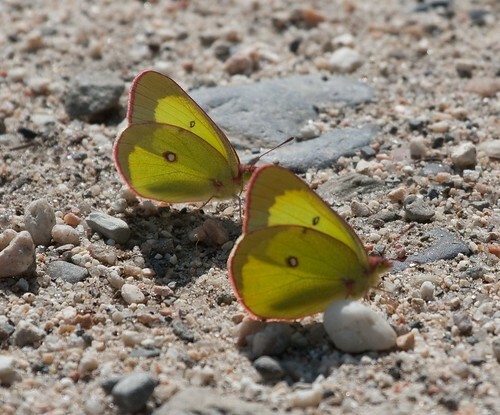 We did stop at a stream crossing, which didn’t have a ton of dragonflies but did have Pink-edged Sulphurs and Two-spotted Skipper. Stud Mill Rd ends up back near Orono, so we returned to the hotel. Most people went to Governor’s for dinner. Wally and I joined them, but lucked into our own table, so we got served in half the time. The fried fish was excellent (and cheap). Saturday 6/26: Today was the meeting day. It was held right up the street from my hotel, so I walked over. At this point, I barely remember the talks, but they were pretty much all enjoyable. I joined some of the Massachusetts crowd and the Hummels for lunch at some pizza place, where the eggplant parm sub was fair. After the meeting, we had a cookout at the nearby Hirundo wildlife refuge and took the photo. After the photo, people began splitting up to go look for shadowdragons (Neurocordulia). I (and Josh and eventually Glenn) ended up following Steve and Cliff to a nearby river crossing. We found one exuvia (anyone ever ID it) and eventually had a few fly by. Cliff or Steve managed to catch one, which turned out to be an Umber (N. obsoleta). Fortunately, it was dark enough that even with totally wrong camera settings I couldn’t screw up. After being eaten alive by mosquitos, we let the shadowdragon go and went back to the hotel. As promised, here’s the first day of my trip to Maine for the Dragonfly Society of the Americas annual meeting. The meeting was scheduled to begin with a late afternoon social thing. Since it’s about 5 hours to Orono, I decided to head up early and make a couple birding stops along the way. I left the house a little after 6 and reached the Kennebunk Plains at about 8:30. 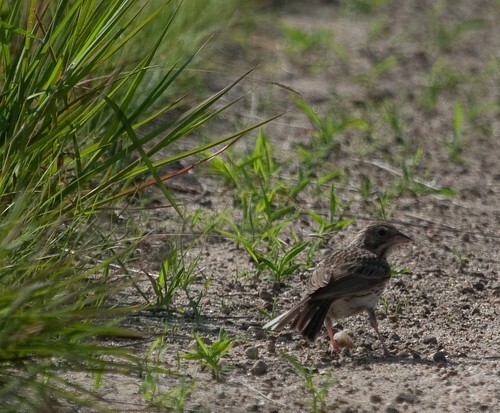 The plains are a big open grassland with all sorts of interesting birds. 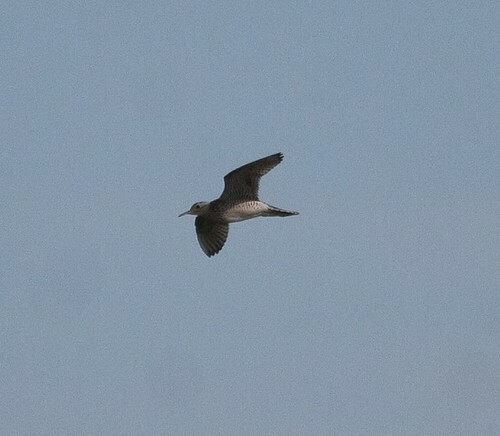 My main target was Upland Sandpiper and I wasn’t even 50 feet from the car when one made several passes overhead. It circled and called quite a bit and landed occasionally. Most of the time on the ground, it was hidden in the grasses, but I did manage one shot. Upland Sandpiper was a long-overdue life bird so I spent a good bit of time enjoying them (there were at least two right there). 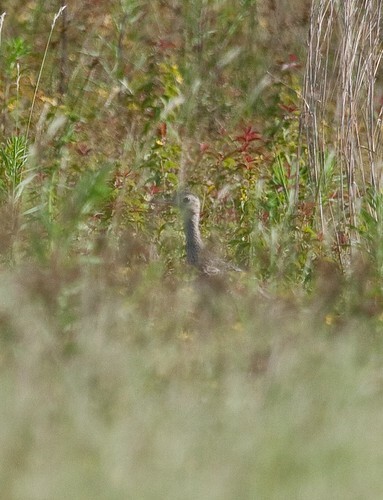 Very much a curlew. 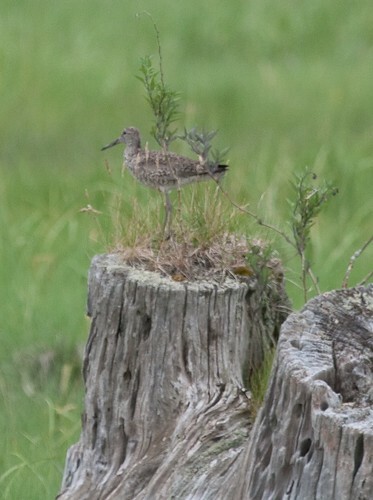 Once I had my fill of the sandpipers, I continued down the trail hoping for a few of the other specialties. 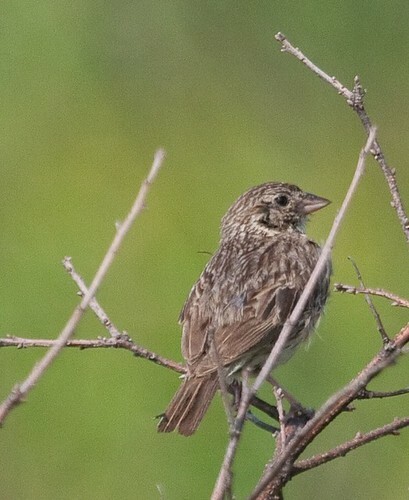 Grasshopper, Vesper, and Clay-colored Sparrows all apparently breed here but I was only able to find Vesper. Fortunately, there were several and they were very cooperative. I eventually worked my way down to some water, which was pretty quiet. It was getting hot, so I headed back to the car (stopping for the sparrows again) and moved on. My next stop was to be Scarborough Marsh. However, I got somewhat lost along the way (not sure if there’s been new development since the birder’s guide to Maine was written or if I was just in the wrong spot for the entire time) so it took an extra hour. Once at the marsh, it was drizzling a bit. I decided that I didn’t feel like carrying the scope and would just take a quick walk out. The usual birds were around including many egrets, a few Glossy Ibis, and Willets. 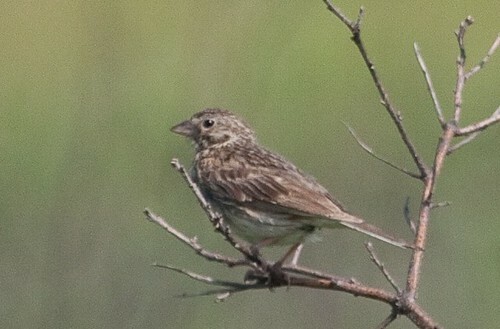 Sharp-tailed Sparrows were singing a good bit and I got some brief views. I suspect most were Nelson’s but one appeared noticably brighter, so that was probably a Saltmarsh. 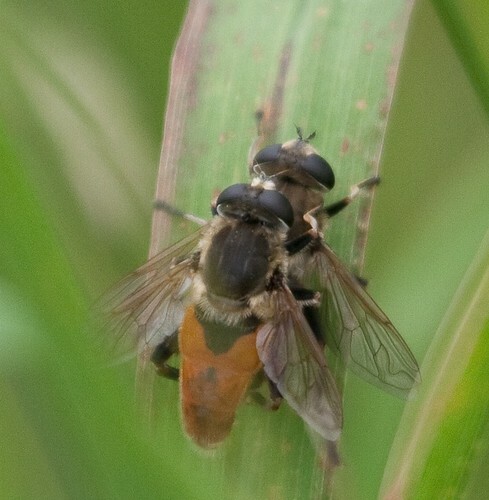 After following the path most of the way out, I headed back to the car for lunch (stopping for these neat flies on the way). From here, I headed straight up to Orono, arriving early afternoon. I checked into my hotel, showered, rested a bit, and then headed to the main conference hotel. The group was taking over the lobby and I quickly was saying hello to many of the people I had met last year and meeting many others that came from further away. After an hour or so here, we moved in a large group for dinner. This wasn’t the best idea as the nameless (only partially because I don’t remember it) restaurant was not capable of dealing with 30 people at once. The waitstaff was new but almost had things under control but the kitchen did not. My table got food probably 20 minutes after the other tables. For a slightly more expensive place, I wasn’t impressed with the obviously frozen green beans and packaged rice pilaf. Once we finally managed to get away from the restaurant, we returned to the hotel where the initial meeting had already just about finished. Fortunately, they ran it again, so we were briefed on possible locations for tomorrow’s field trips. After that, it was off to the hotel and bed for a fairly early start.